You can pre-make these and store in the fridge, to grab later for an “anytime” meal, on-the-go fast food, or a late night dinner. I was delighted to find Perdue chicken nuggets in the reduced meat section of our local store. It didn’t matter that they were shaped like “cars.” My teens didn’t mind at all! The lettuce in this reduced package was colorful, convenient, and inexpensive. Warm chicken in 425 degree oven for 15 minutes. Lay out one wrap on plate. Spread very lightly with mayonnaise. Break one piece of American cheese in half. Place 1/2 on each side of wrap. 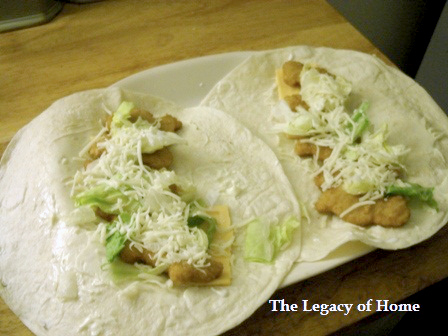 Top with 5 pieces of cooked chicken, a few pieces of lettuce and a sprinkling of mozzarella cheese. Top with a few dashes of Ranch Dressing. Serve immediately, or package in plastic wrap to save in fridge. These can be re-heated in microwave, to slightly warm and melt the cheese, for 30 seconds. Now that is smart – love the idea of make ahead for on the go.